The day after Halloween, I went for a wander into town armed with vouchers and without any thought of the next impending holiday. But as I searched the stores, with most clothes suddenly transformed into swathes of sequins and glitter, I could hear a familiar hum on the speakers. Interspersed with the usual songs were Christmas hits. I thought of the newly carved pumpkin on our balcony, of the other one we didn’t get around to doing as we watched scary movies the previous night and the millions of spiced candles still dotted around the flat. No, I wasn’t quite ready for Christmas just yet. My American auntie had quipped on Facebook a couple of days later that we needed a Thanksgiving in the UK, just to break up the time between scary movies and Santa. I have to say I agree with her, a little stop gap between holidays to be a bit thankful this time of year wouldn’t go amiss. The remaining uncarved pumpkin sat unused on the kitchen counter and one evening I decided to transform it into my first ever pumpkin pie. It was a bit of a risk really, I’ve never tried a slice in my life but I wanted to turn that gourd into something useful. I stepped back from my handiwork around midnight and felt a sense of pride, desperate to dive in but waiting just that little bit longer for it to chill in the fridge. With most things, there was no way I could present to my eyes a ‘naked’ pumpkin pie and searched my kitchen for some way to jazz it up a little. 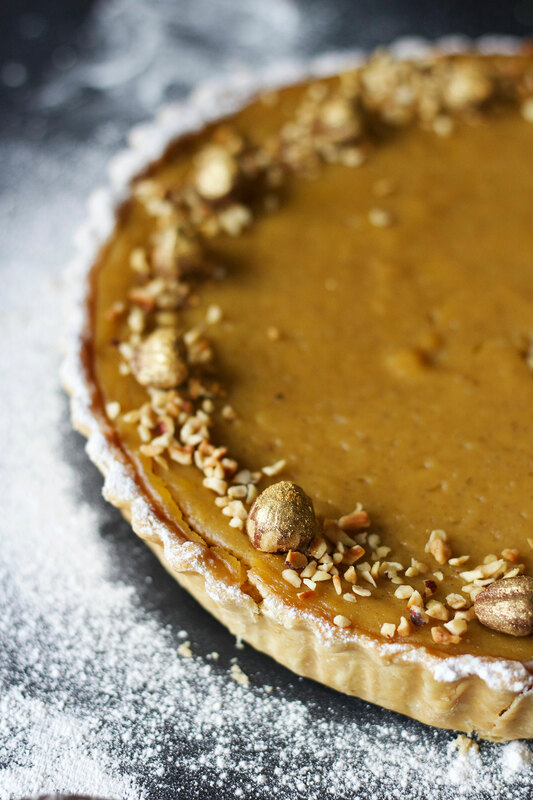 Of course my go-to gold lustre dust and a packet of hazelnuts provided a little glitz and crunch to the finished pie – silky smooth, rich in flavour and full of spice. I’ve read a lot that Brits liken it to custard tart but since that’s something I’ve ever eaten either, I’ll leave it up to you to decide. We may not have a holiday to separate us from Christmas, which is creeping up ever closer, but I would be happy to at least declare a pumpkin pie day in the middle of November as a compromise. Preheat the oven to 220oc/200oc fan. Cut the pumpkin into quarters and scoop out the seeds and stringy pieces of flesh. Drizzle with a little olive oil and roast for around 40 to 50 minutes until the flesh is soft. Remove from the oven and carefully scoop the flesh away from the skin, weighing as you go. You’re looking for around 750g of flesh, any leftovers can go into soup or a pasta dish. Once the flesh has been removed, puree with a hand blender until smooth then place in a sieve to remove any extra water. Leave the puree to one side while you prepare the rest of the pie. To make the pastry, place the flour, icing sugar and butter in either a food processor or a large bowl and blitz or rub together to a breadcrumb texture. Add ¾ of the beaten egg (don’t discard the rest just yet) and pulse or stir through to create a smooth dough. Bring together with your hands then wrap in clingfilm, flattening into a disc then refrigerate for 30 minutes to relax the dough. Place a large piece of clingfilm on a clean worktop and roll your chilled dough to around 5mm. Lift the clingfilm and invert into a 23cm fluted flan tin, carefully pressing into each groove. Freeze for 10 minutes or refrigerate for 30 minutes to ensure your pastry case does not shrink whilst baking. When you are ready to bake, preheat the oven to 200oc/180oc fan and trim the edges of your pastry case. Line with baking parchment or foil and weigh down with baking beans or pulses. Bake for 15 to 20 minutes until the pastry feels dry, then remove the beans and the foil or parchment and paint on the remaining egg across the bottom, sides and top of the case to ensure the filling does not leak. Place back into the oven for one to two minutes until golden, then remove from the oven. Increase the oven temperature to 220oc/200oc fan. In a large bowl, combine the sugar, salt and spices and whisk together. Add the eggs, milk and melted butter and whisk together until smooth then add the pumpkin puree. Stir to combine. Place the pastry case on a baking sheet and carefully pour in the filling, levelling off the top with a spatula. Place in the oven to bake for 10 minutes then reduce the heat to 180oc/160oc fan and bake for a further 35 to 40 minutes until the filling has just set. Remove from the oven to cool and once completely cool, place in the fridge to chill. 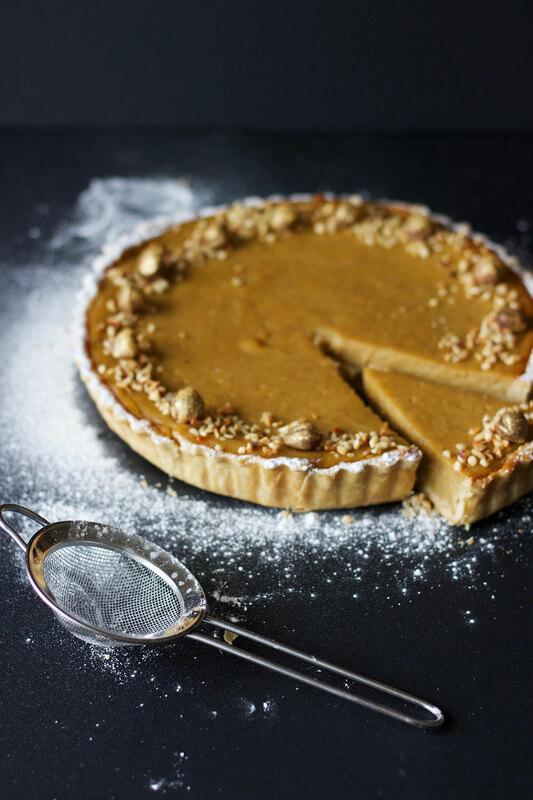 When ready to serve, finely chop half of the hazelnuts and sprinkle around the edge of the pie, then spray or paint the whole nuts with golden lustre dust. Arrange around the pie before cutting into slices. Em, YUM. I need to try this. I want pumpkin everything. YES. My fellow pumpkin spice lover! Haha yes you need to try the real thing! 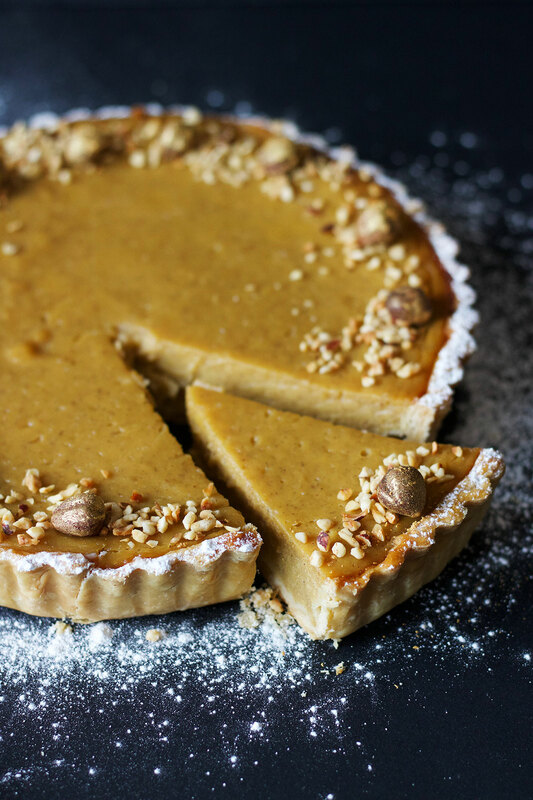 Mmmm… I love pumpkin and hazelnut so I will have to try this recipe sometime. OMG this sounds so delicious! 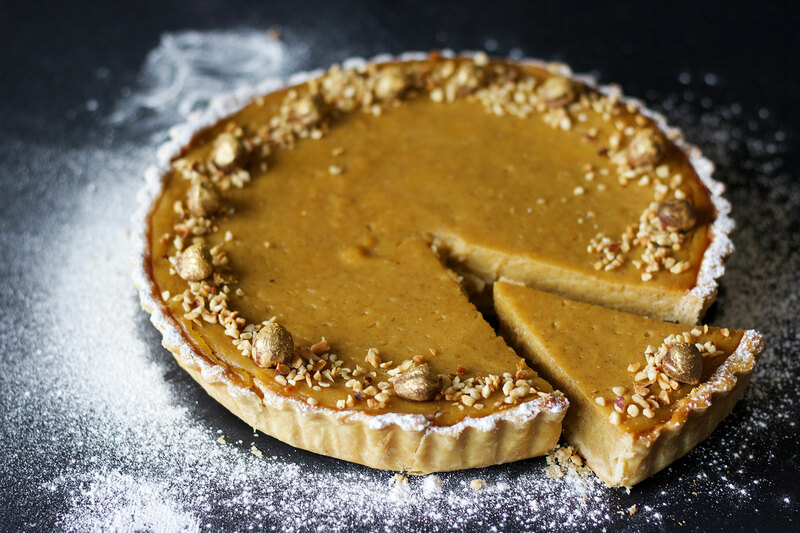 Pumpkin is my favorite pie and I think the hazelnuts would add a really interesting twist. Bookmarking this for next fall! Thanks Ann! Hope you enjoy it! Love the sound of this! Hazelnut is so delicious! Thanks Caitlyn! I love it too! 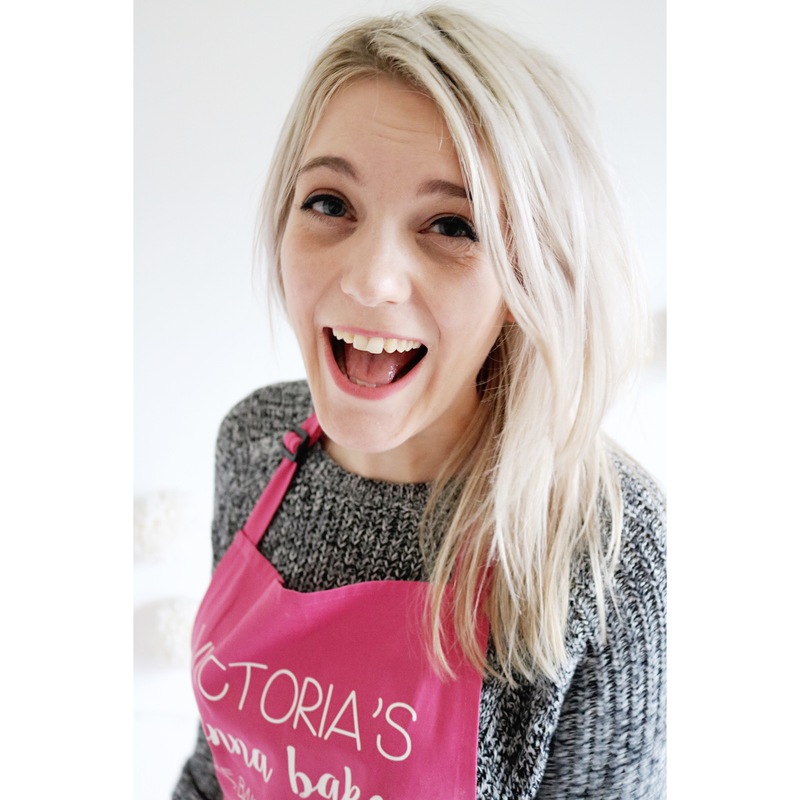 Welcome to Victoria Sponge Pease Pudding, a blog celebrating all there is to love about the endless combinations of butter and sugar.